The clockwork barrel organ is part of an elaborate clock in the Rothschild Collection at Waddesdon Manor https://waddesdon.org.uk/. It was restored in 2006 by Dominic Gwynn and Stuart Dobbs for the National Trust. The clock and clockwork were restored by Peter Watkinson of Chard, Somerset, and the case was restored by Tankerdale Workshops of Sheet, Hampshire. 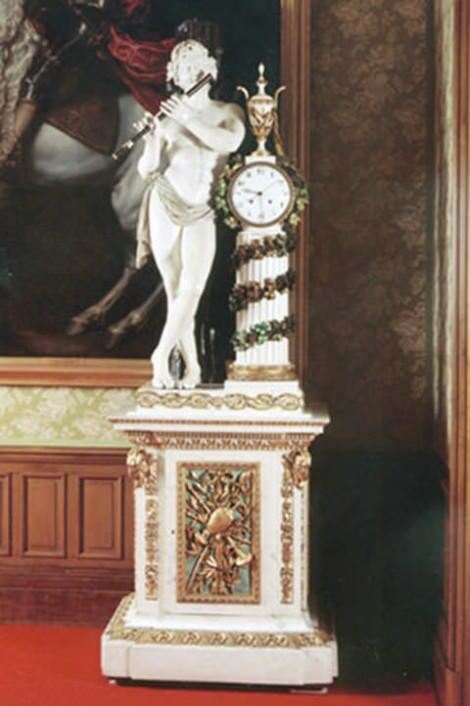 The case of the clock is made up of a lower pedestal, embellished with French style carving and painted in a marble effect. Standing on top of the pedestal is a carved wooden figure of Orpheus playing a flute. Behind him is a large tree trunk, which has a serpent circling around it up to the top. The gut line for the clockwork motor travels up to the top of the trunk and over a lignum vitae pulley and back down to a double line with the weight attached. On the hour the clock sets the organ playing its tune. The organ part of the clock is quite a simple but very well engineered device consisting of the clockwork motor, bellows and feeders, windchest, pipes and barrels. There is no sign of any manufacturers name on the organ but on the bottom of the feeders in pencil is written Imhof & Muckle, London. Imhof & Muckle were a German company who eventually built organs in England but at a later date than this organ seems that they were just the supplier in this case. During the removal of the leather from the reservoir a pencilled name was discovered: Sorg 1869 inside the leather and Henry Sorg London on the middle board. On the end of each barrel there are inscriptions again in pencil about the tunes. These are written in Dutch so it is thought the organ may be of Dutch origin. The windchest is laid out with two wooden ranks on either side of the centre line, the largest pipes in the middle, one being a Gedekt and the other an Open Fluit. The Open Fluit also has an Octave Open Fluit, which can be manually shut off using a slider. The notes of the organ from the centre out are d – e 27 notes covering just over two octaves chromatically. The windchest is constructed using beech throughout and consists of a small well with 54 pallets. One of the barrels has been restored, and plays movements of a concerto, not yet identified. The other barrel will be difficult to restore; it played an overture called Tancredi.